Have you ever wondered why you would instantly associate a photo you see on Instagram, with the company that posted it, without even looking at the username? Such instinctive behaviour is important to capture users’ attention for the message you intend to deliver in that post, be it the launch of a new product or to promote brand awareness. Also, since Instagram alone boasts about 800 million users, this platform definitely should be given some attention and can be a powerful marketing tool if used wisely. 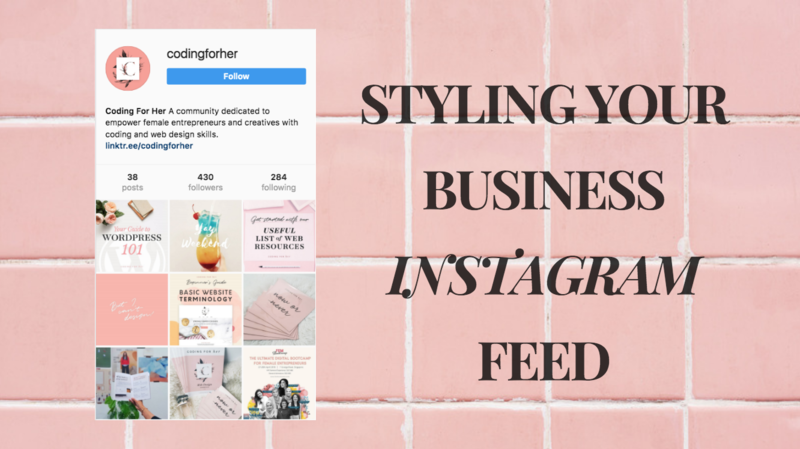 To keep this blog post short and sweet, we will be focusing on how you can style your instagram feed to match your business need (Hey! that rhymes! :)) with some ideas/tips, followed by some tools you can use to do so! To launch a new product/service, you could create a series of 6-9 photos or videos to showcase it. Any shorter and your message might not get across, but any longer and users who might not be interested in your product/service could get annoyed. Let’s look at @yslbeauty and the launch of their new black opium perfume as an example. This series consistently focuses on their perfume rather than a mix of their other products. Assuming they are posted within a 1-2 week time frame, it would constantly remind viewers of the launch of this new product, thus working its *marketing magic*. In essence you could think of your series as a chapter of the book that is your Instagram feed. Apart from having a mix of photos and videos, it’s important to consider how the main focus of the post is showcased. For example, If you were to use idea #1 and post 6-9 photos of the same thing, viewers would inevitably get bored after the first few posts. Look back again at the series of perfume posts by YSL again. 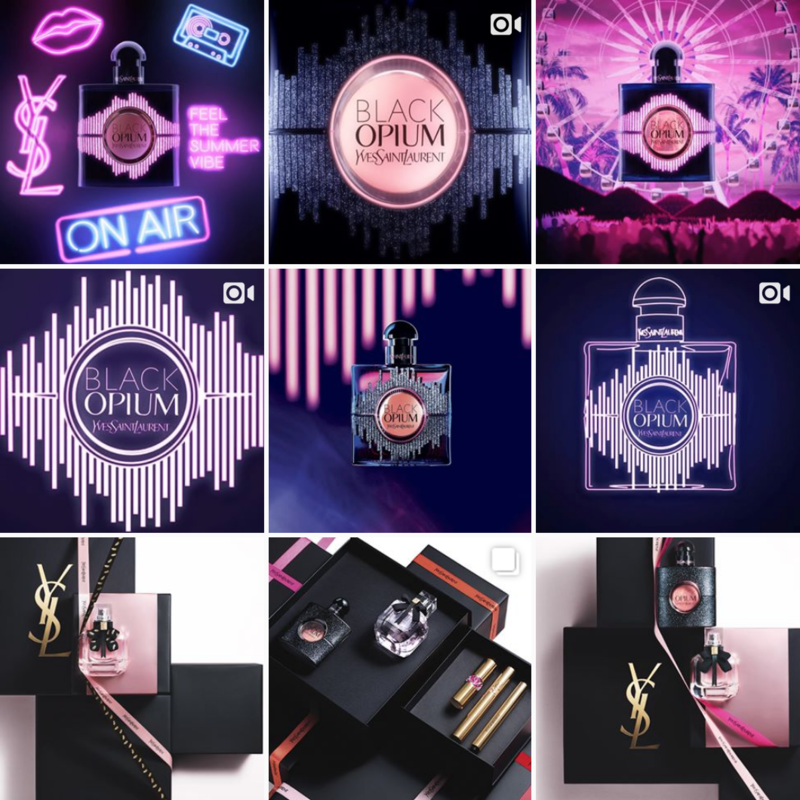 Do you notice that even though the focus was always on selling the perfume, the way it was done was different in each post? Instead of only showcasing the actual product in all posts, there was a good mix of the logo, drawing of the perfume, the actual product and digitalised versions of them. This ensures that the visuals remain interesting even though they are all talking about the same product! One of the ways a company can be instantly recognisable is the colour scheme used. 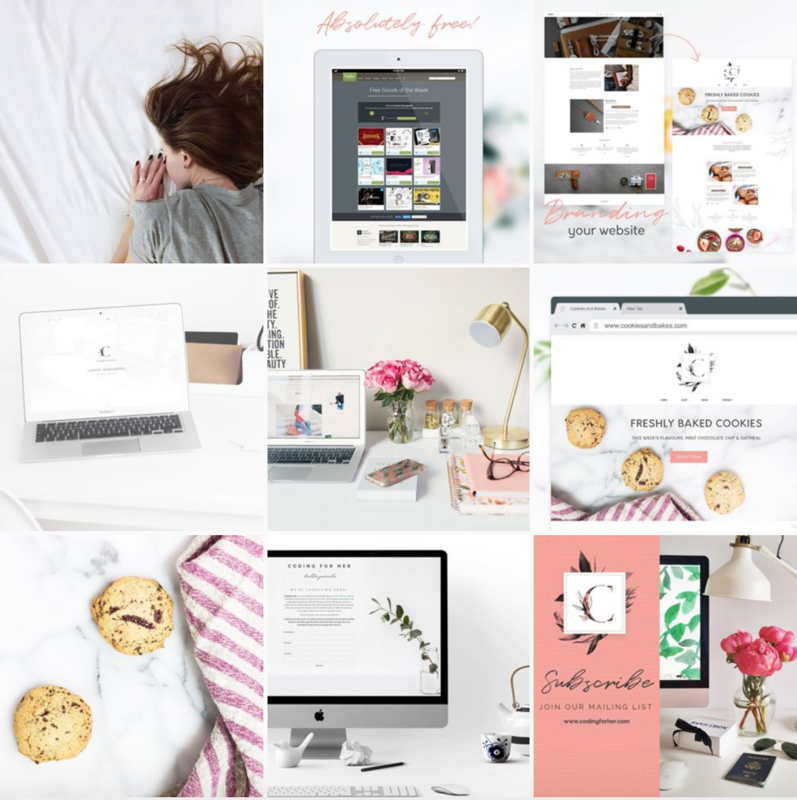 Take a look at @codingforher’s Instagram feed. Do you notice that they consistently use a mix of whites, pinks and greys even though they may be of different shades? Now take another look at the website you are at (aka www.codingforher.com). This colour theme is similarly used throughout the website. Of course, it could be possible that your entire Instagram account may not be able to follow a single colour scheme. In that case, maybe you could again use the concept of a series so that each one follows a specific colour scheme! With these ideas/tips on how to style your Instagram account, allow me share some tools you can use to do so. Images are very important since they do most of the talking. My advice would be to invest in some photos that are unique to your brand. These can be used on its’ own, or layered over background images you can find from Unsplash, Pexels and Pixabay. Of course, the use of photoshop would be ideal here, however, if you do not have access to that, a good alternative would be GIMP. GIMP is an open-source GNU image manipulation programme (That’s where its’ name came from) that functions most similarly to photoshop. Here, you’ll be able to control the finer detail of an image. Another great alternative would be Canva. With Canva, you can upload your own images, use those provided and even add some texts in. Some of these images are free, whilst others start from one-time payments of 1 USD. You can also choose to upgrade your account for greater access to the paid ones for free. That’s it from me! I hope this article gave you some nifty tips and tricks on how you can style your Instagram account better and the available tools for you to do so.